A cataract is a clouding of the natural lens as your eye ages. This lens (located behind the iris - the colored part of the eye) works just like the lens of a camera - focusing light images on the retina which sends the images to your brain. 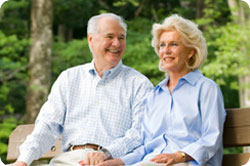 One of the greatest "medical miracles" is modern Cataract Surgery. This surgery that was once fraught with risks and at best a lifetime of thick, unsightly glasses is now being used to safely improve the quality of life for millions of Americans every year. Surgery to remove the natural lens is one of the most commonly performed procedures today, with well over 2 million cataract and lens implant procedures performed annually. 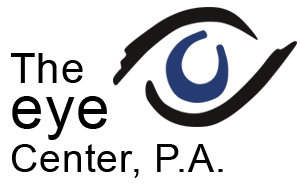 IOLs, also known as intraocular lenses, have been used for over 50 years to restore vision after lens removal. 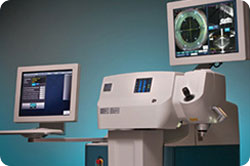 The physicians at The Eye Center are some of the country's most respected lens implant surgeons. 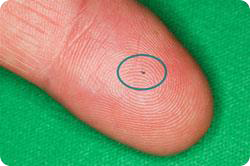 With the current modern techniques, cataracts are removed through tiny incisions that usually do not require stitches. Cataract Surgery is normally painless and takes less than 20 minutes with vision improvement usually achieved within 1 - 3 days. Rather than inside a general hospital, your procedure will take place in a state-of-the-art facility designed exclusively for eye surgery. This means the most appropriate and supportive environment and the best possible experience for you! With conventional lens implants, good functional vision can be achieved with the use of glasses to maximize your vision at distance and near. The revolutionary new technology multifocal lens implants may reduce or even eliminate your need for bifocals after the surgery. Lens implants are meant to last a lifetime. Fortunately, most people will be very happy with whatever lens implant choice they make. The Tecnis Multifocal Lenses and the Toric Lenses to correct astigmatism have all been rigorously tested by the US FDA before being approved for use. For most people, any of these lens options will provide excellent results. Patients may choose to have these advanced lenses implanted when they undergo Cataract or Prelex surgery. Unlike traditional single-vision lens implants, these Tecnis Multifocal Lens provides quality vision both at a distance and up close. Traditional lenses usually provide good vision only at a distance with limited ability to see objects that are near without glasses. The Tecnis Multifocal lens has proportioned visual zones that provide it with its major advantage.